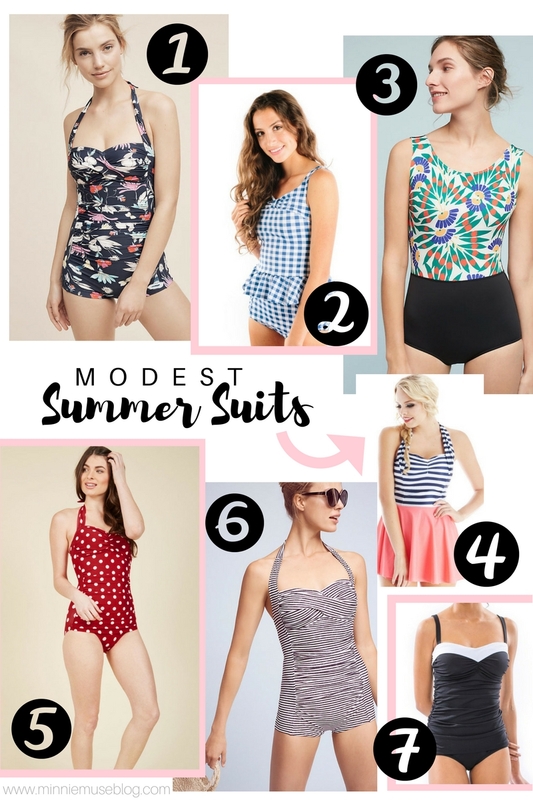 In my latest post I talked about summer heat and swimsuit season, and because of that I thought it would be fun for me to talk a bit more about swimsuits, share my tips for how I pick them, my favorite styles, and places you fan find cute and modest suits! Now, like I said in my last post, I might have different swimsuit standards than you, but regardless of that I love each of my summer swimsuits and feel equally covered, confident, and modest in each one:) I have slightly evolved in my swimsuit styles over the years and have started going more with classic and retro styles (which fits with my personal style). When I was growing up my summer suits typically consisted of a swim skirt and a modest tankini top, but over the years I have discovered other suits that fit my style more accurately and still align with my modesty standards. Truthfully, there is often a fine line between modest and immodest when it comes to swimsuits and ones standards. Some people choose to wear swim shorts with a swim shirt, some a swim skirt and swim top, and others like me a modest one piece or tankini. It really comes down to what you are comfortable in and what your standards for modesty are. Thus, while it is sometimes hard to find a suit that fits into your standards, if you look hard enough or find brands with a focus on modesty the hunt will be a bit easier. I will say however, that my #1 TIP for finding a good quality and well fitting modest one piece is to shop in the women's section. You will never find (for the most part) anything that covers in its fit in the junior section, so the women's department is always where I look. Nonetheless, if you want something more trendy without sacrificing modesty, take a look at Jessica Rey, who my sister and I are both wearing this year (and LOVE). Their styles are to die for, they are all made in the USA (bonus points for being ethical), some are vintage inspired (and even named after Audrey Hepburn characters) and one of their sayings is "it doesn't have to be itsy bitsy" which fits perfectly in line with my swimsuit views! Hope you enjoyed getting a glimpse into my swimsuit thoughts and can't wait to share more summer pool style! I have been looking for a vintage inspired skirt swimsuit! All of these suits are super cute!